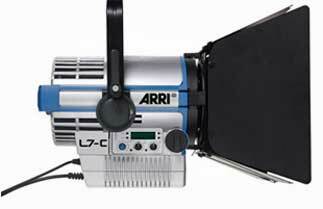 The ARRI L7-C Color LED Fresnel is part of is at the vanguard of a new generation of lighting equipment that can be seamlessly integrated into the studio or onto the set without sacrificing features or performance. The key characteristic of any Fresnel is flood to spot capability and the L7-C meets and exceeds expectations with an impressive beam angle of 15-50°. There's simply no learning curve or accommodation to be made when swapping out L7s fixture for fixture with standard Fresnels. In fact, you're not going to be moving them around or juggling scrims in high places thanks to the 100 - 0% on-board dimming. The L7-C is a "fully tune-able" white light source, too, allowing you to match existing fixtures from a warm 2,700K to ice-blue 10,000K. 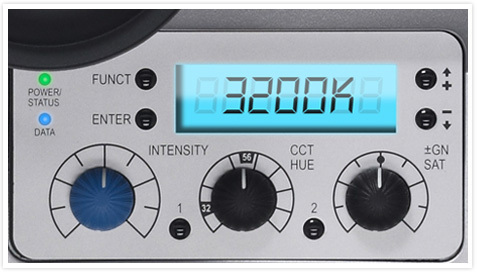 The on-board controller allows manual intensity control as well as color temperature and +/- green. Specific color shades and skin tones can be matched through the full gamut color mixing feature. All of the functions can be controlled via DMX, an ideal feature for broadcast studios. And the L7-C will be seen but not heard thanks to its dead quiet passive cooling system. While inclement weather might annoy the talent it won't kill your light since L7-C has an IP54 rating making it impervious to falling rain and splashing water. The L7-C LED source produces the equivalent of a 750W tungsten light while drawing only 220W for a savings of a whopping 75% over similar output tungsten lights. And low heat means lower AC bills in the studio. You can actually run 9 L7s off of a 20A, 110V outlet as opposed to two 1,000W or three 650W standard fixtures. When it comes to performance and features, the L7-C might just be the perfect light source. Quality of light begins with the field. Smooth intensity, uniform color, even illumination: all are traits shared by the L-Series and conventional ARRI Fresnels. And, as Fresnel fixtures are already workhorses of the lighting industry, designers and technicians now have nothing new to learn in order to use LED technology. A key element of the versatility of traditional Fresnels is the ability to spot and flood the beam as needed. Whether it's a flood field for a pullback shot or a tight spot for a bright highlight, the continuous focusability of the L-Series performs lives up to your expectations. And, unlike traditional Fresnels, which have significant light waste in spot focus, the efficient L-Series optical system maintains the same field lumens in all focus positions. Clear, defined shadows have traditionally have only been a trait of single source tungsten and daylight fixtures. 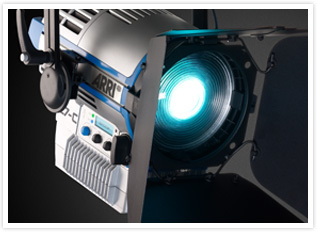 ARRI L-Series Fresnels provide the same single shadow properties designers expect, delivering natural results. With the L7-C, fully tune-able white light can be adjusted for different skin tones, camera sensors and mixed-light environments, while specific color shades can be matched through full gamut color mixing. Unlike other LED fixtures, this level of color control does not involve compromising the quality of the light field: the L-Series is unique in combining uniform light and single shadow rendition with absolute control of color attributes. To satisfy the rigorous sound requirements of modern broadcast studios, the groundbreaking L-Series passive cooling system incorporates no moving parts or fans and is therefore completely silent; it can be used in ambient air temperatures of up to 95° (35°C). One of the most significant accomplishments in terms of the L7's robustness is the IP54 rating for weather resistance. The entire fixture is protected from falling rain and splashing water, at any angle, while the internal electronics, optics and LEDs are protected from dust, dirt and humidity. True Blue-style focus knobs provide the precise adjustment and rapid flood-to-spot that users enjoy from manual, mechanical control. Knobs on both sides of the fixture ensure easy access from all positions, eliminating the need for awkward reaching around the fixture. Turning the knobs is neither tedious nor time-consuming; full flood-to-spot can be achieved in only three turns. The ARRI sliding stirrup design enables precise adjustment of the fixture's center of gravity, to compensate for front-end accessories. It also creates the option of pulling the fixture back and reducing its hanging height. With an extremely slim profile, the extruded aluminum yoke provides high strength without added weight. An optional pole-operated yoke allows full operation of pan, tilt and focus from the floor and is therefore a popular choice for many studios. The high strength tilt lock provides extremely secure locking, eliminating movement and slippage and ensuring that the fixtures will stay where you put them. For broadcast studios, remote fixture control is of paramount importance, and all functions of the L7 are controllable through DMX. The L7 is also fully RDM compatible, providing bi-directional feedback and reporting of parameters including system status, hours on the light engine, calibration data from the internal color sensor and current DMX address (with the ability to remotely assign and address all fixtures in a DMX network). The on-board controller has manual intensity adjustment and additional controls for color temperature and plus/minus green, which can be switched to manipulate hue and saturation at the touch of a button. There is much discussion about the "green" credentials of LEDs in the market, but perhaps the most compelling aspect in this regard is the associated cost savings. L-Series fixtures reduce electricity usage by 75% and their LED light engines last 200 times longer than normal bulbs, when compared to conventional tungsten Fresnels. These and other cost-saving attributes will combine to affect a rapid return on your investment. Lighting teams working on location will love the versatility they can achieve in small to medium-size packages. 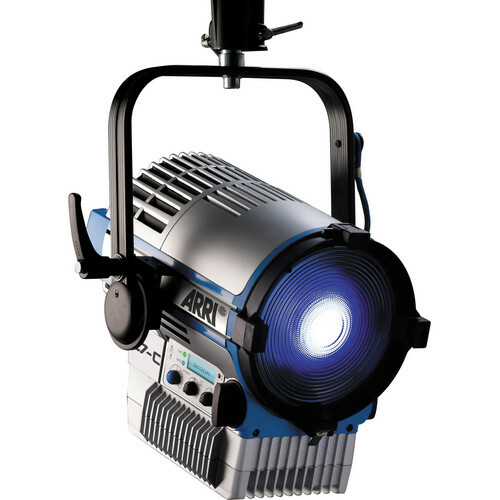 Nine ARRI L7 Fresnels can be run off a single 20 A, 110V outlet, as opposed to only two 1000W or three 650W tungsten Fresnels. The L7 is an expansible platform designed to adapt with the latest enhancements in LED chip performance. The light engine is fully upgradeable, ensuring that the fixtures can take advantage of technology advances as and when they happen. The firmware is also upgradeable through the USB port on the rear of each unit, accommodating future control protocols such as ACN and incorporating other system enhancements that may become available in due course. In addition, future optic accessories will bring new levels of functionality to the platform, further expanding the L-Series versatility.